This fried cauliflower recipe is Italian and quite frankly, absolutely awesome. The batter is a very basic batter other than the fact that it uses shredded Parmesan cheese as one of it's ingredients. This cheese adds a nuttiness to the end product, and it is far superior to other cheeses for this method. Why? It doesn't get rubbery or runny during the frying process. The dish is so good we don't dip it in anything, although a tangy horseradish sauce or Italian dip could compliment it well if you absolutely want that contrast of dip to crispiness. One challenge people have when doing a fried food is coming up with the crispiness. They key to this fried cauliflower recipe is what you do AFTER you fry the cauliflower. Watch the video to see what I mean. Do you have questions about this recipe? CLICK HERE to ask Dave personally. He will respond within twenty-four hours, probably sooner. And don't forget to watch the video below that we made specifically for this recipe. If you have your own favorite side dish recipe, please CLICK HERE. Please watch the video below on helpful tips and specific directions on making this fried cauliflower recipe, but here are some important ones. A bag of the frozen cauliflower flowerets will work fine. Just cook them as directed. DO NOT overcook the cauliflower in the first stage. Otherwise, it turns to mush. Don't crowd the cauliflower while frying them. IMPORTANT! Drain the oil away from the cauliflower when it is done frying. Watch the video to see what I mean. You can add other flavorings to the batter. We added Fuzzy's Kicker in a second batch we made. 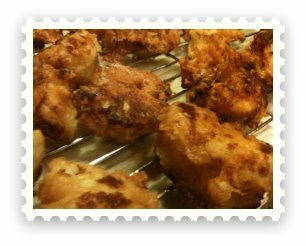 Leave Fried Cauliflower Recipe and Return to BBQMyWay Homepage.